Claim: Data does not prove that climate models are wrong | Watts Up With That? Alex Sen Gupta, a biological scientist, has written an article (reviewed by John Cook) which attempts to defend the validity of climate models which can’t predict the climate. To understand what’s happening, it is critical to realise that the climate changes for a number of reasons in addition to CO₂. These include solar variations, volcanic eruptions and human aerosol emissions. The influence of all these “climate drivers” are included in modern climate models. On top of this, our climate also changes as a result of natural and largely random fluctuations – like the El Nino Southern Oscillation, ENSO and the Interdecadal Pacific Oscillation, [IPO] – that can redistribute heat to the deep ocean (thereby masking surface warming). Such fluctuations are unpredictable beyond a few months (or possibly years), being triggered by atmospheric and oceanic weather systems. So while models do generate fluctuations like ENSO and IPO, in centennial scale simulations they don’t (and wouldn’t be expected to) occur at the same time as they do in observations. The problem with this claim is that, as Gupta says, the climate models are supposed to take these random fluctuations into account. Climate models are supposed to accommodate randomness, by providing a range of predicted values – the range is produced by plugging in different values for the random elements which cannot be predicted. However, observations are right on the lower border of that range. The divergence between climate models and predictions is now so great, that climate models are on the brink of being incontrovertibly falsified. As Judith Curry recently said, If the pause continues for 20 years (a period for which none of the climate models showed a pause in the presence of greenhouse warming), the climate models will have failed a fundamental test of empirical adequacy. This is important, because it strikes at the heart of the claim that climate models can detect human influence on climate change. If climate models cannot model climate, if the models cannot be reconciled with observations, how can the models possibly be useful for attributing the causes climate change? If scientists defending the models claim the discrepancy is because of random fluctuations in the climate, which have pushed the models to the brink of falsification, doesn’t this demonstrate that, at the very least, the models very likely underestimate the amount of randomness in the climate? Is it possible that the entire 20th century warming might be one large random fluctuation? Nature is certainly capable of producing large, rapid climate fluctuations, such as the Younger Dryas, an abrupt return to ice age conditions which occurred 12,500 years ago. You can’t use climate models which demonstrably underestimate the randomness of climate change, to calculate how much of the observed 20th century warming is not random. If current mainstream climate models cannot predict the climate, then scientists have to consider the possibility that other models, with different assumptions, can do a better job. It is no accident that Monckton, Soon, Legates and Brigg’s paper on an irreducibly simple climate model, which does a better job of hind casting climate than mainstream models, has received over 10,000 downloads. As every scientific revolution in history has demonstrated, being right is ultimately more important than being mainstream, even if it sometimes takes a few years to win acceptance. For now, mainstream climate scientists are mostly hiding in the fringes of their estimates. When they acknowledge it at all, they claim that the anomaly, the pause, is a low probability event which is still consistent with climate models. Hans Von Storch, one of the giants of German climate research, a few years ago claimed that 98% of climate models cannot be reconciled with reality – which still, for now, leaves 2% possibility that climate scientists are right. Is the world really preparing to spend billions, trillions of dollars, on a 2% bet? 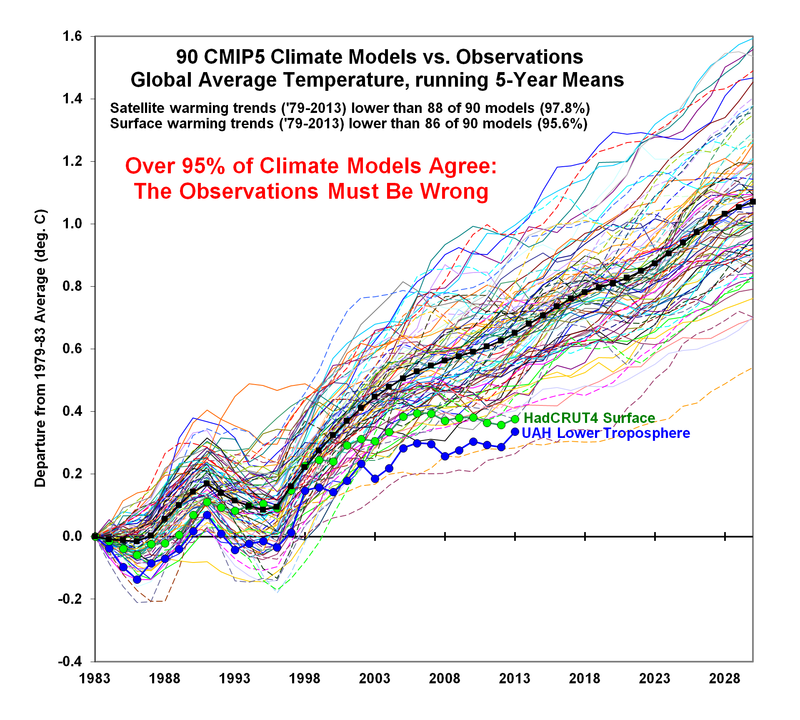 May 29, 2015 in Alarmism, Climate Models. ← When Will Climate Scientists Say They Were Wrong? Looking at the Graph the Green and Blue circles represent Measurements? But are they actual measurements or adjusted measurements? @Bryan: In the first graph the data are five-year running means; in the second, they are annual anomalies. Bryan A, you also missed the fact that the top two plots are HADCRUT 4 Surface temperature and UAH Lower Troposphere and the lower two plots are the Average of 4 Balloon Data Sets and the Average of 2 Satellite Data Sets. The second diagram is for the mid-troposphere. It appears to be based on John Christie’s testimony to the US Congress. The “data” is generally gathered from planet earth. None of the models actually model planet earth. Well this could save a lot of money. Stop collecting data altogether and just run the models. Add software that generates automated press releases and voila a much more efficient climate change propaganda machine. That’s exactly what their “solution” is. Take from the rich and give to the poor. And they tell each other that they’re on a moral high horse like Robin Hood. But they’re wrong. Robin Hood took from the government, which had overtaxed everyone, and he gave the money back to the people who’d earned it, the people who’d been impoverished by the high taxes of a big government. In fact, the main reason why people are impoverished around the world is that their governments are oppressive and corrupt. Giving such countries money doesn’t help the people any more than giving money to the Clintons helps suffering Haitians. Most of the aid money there is that gets past the bureaucracies that processes it goes straight into the pockets of corrupt regimes it’s gifted to, enabling them to extend their oppression. Communism never solves problems. It just makes them worse. … plus a [Need more funds] button. jimmaine, yes, that’s what this is all about. The Left will follow it even if it is proven to be a false hypothesis. It’s a means to an end. It’s why they love the Precautionary Principle. Hey boys and girls, let’s run with this warming thing, because it is a way to get socialism in through the back door. You’re obviously not had to write checks for 45% of your income to the city, state, and fed for taxes. Doesn’t the top 10% pay 60-70% of the fed income tax, while the bottom 40-50% not pay anything, and in some cases get money back? The single biggest impediment to getting rich is the face in the mirror and the taxman. Bitter, you bet. People have the wealth redistribution all wrong. It is NOT take from the rich and give to the poor …. it is take from the public and give to the elites. That is why they are so vested in pushing this thing through … for their own financial benefit!! That is why so many unethical “climate scientists” are on the take … because they want a piece of the pie. The “sheep” who support this crap … otoh, the rank and file zombies, with no brain outside of what they are told to think and say …. well, they will be herded to the slaughter house. basic difference between liberals/socialists and conservatives. Liberals believe there is a finite amount of wealth, and it must be “appropriately assigned” in a “fair” way. Conservatives believe wealth can be created. And yes, those in control have no intention of distribution to the poor. The models are learning experiments based on hypothetical start points, to see how the system might react to various “fiddles”. They don’t even take real starting points! Just a quick question on the graphic, which we have all seen a hundred times. The blue line is labeled as UAH lower troposphere. But it looks nothing like UAH over at Roy Spencer’s site. In particular, the very distinctive peak of the 1998 super El Nino is absent in this graphic. Is the UAH data presented here really mid level or upper level trop., and just mislabeled? I have no idea if it is mid level or what, but the peak at 1998 looks there to my eyes. When you take a 5 year or 60 month running mean, the 1998 peak disappears. That’s a 60 month smooth? Yikes. No wonder it looks so distorted. But still, the Great Pause, running from roughly 1998 to the present does not seem to be represented very well. An artifact of the smoothing, I suppose. UAH6.0 shows a pause of 18 years and 4 months from January 1997 to April 2015. I could be wrong, but it sure looks to me as if they are still using UAH5.6 since the 18 year plateau is no where to be seen. The data has to be chosen carefully to support the argument, then massaged with different averaging, means, start and end dates etc to provide just the right graphic. By smoothing out El Nino and La Nina outliers, models rid themselves of the very reasons why they diverge above and rarely below observations. These oceanic/atmospheric teleconnected processes not only affect how much solar energy is absorbed but also redistribute absorbed solar energy. Ocean stored heat is sometimes held in, and sometimes released over short and decadally echoed time scales in areas far away from their original storage. This is why Bob Tisdale is the voice in the wilderness staying on point about why models fail to replicate natural short and long term drivers of land and sea surface temperature trends. Yes modelers say ENSO variables are used to produce runs, but they use smoothed data that essentially rids the data of the very ENSO variables they say they use. “Smoothing” is (by definition) a distortion (of reality). You REALLY couldn’t make that up. I should have stopped after the title. These ‘experts’ do not deal with reality. 97% of the Global Warming ‘experts’ have been very wrong for decades. You are not suppose to criticize Global Warming ‘experts’ as it is unlikely you could possibly be as wrong as they have been for so many decades. Paul, The figure 97% was a fraud. They counted number of publications in one study that were in the least agreeable with the “climate changes” idea. Of, course climate changes. The question is whther climate changes now are due to human CO2 and if so how much. Human carbon from CO2 from fossil fuels is 8 Gigatons (billion tons) a year, maybe slightly larger. Decaying organic plant matter releases 60 Gigatons of carbon . 8 divided by 68 is 11.7% of CO2 from both sources ,one natural, and one man made, are due to burning fossil fuels. As pointed out by Eric Klemetti in Scince April 4,2015 both these sources of atmospheric carbon have C12-C13 ratios that are unique. Decaying plants have a -25 ration. Burning coal has a -25 ratio. Burning oil has a -13 to -18 ratio. The atmosphere is now -85. It was previous -6.5 . Obviously only a small fraction of atmospheric CO2 is from human’s burning fossil fuels. It is not reasonable to claim anthropogenic CO2 is the “primary driver” of atmospheric warming and discount natural sources of atmospheric CO2. No one is arguing atmospheric CO2 is now 400 ppm and still rising. However for 18 years now the global temperature trend has been a statistical insignificant flat line. This means there has been no statistically significant additional warming for 18 years desoite CO2 still rising and above 400 ppm. That alone has disproven that CO2 is a primary driver of atmospheric warming. However long term temperatures have shown that for 2000 years we had temperatures in the Roman era, Medieval Temepature Optimum period and Little Medieval Warm period that were higher than now an dthey were before juman’s released fossil fuel CO2. Raymond Borland, If the warmists want to use the 97% figure to paint/tar climate ‘science’ activist researchers let them own the failure. I say leave it up to the researchers whom by their silence allow their field to be a mockery. This month there was an important retraction by a researcher which demonstrated the integrity and courage which seems all too rare. People who use mathematical models should be forced to write them from scratch. FEA and FDE especially with their fancy post processing and animations are very “helpful”. If we could convince programmers of the benefits of writing from scratch, then we would have software that’s a tenth of the size and has a tenth of the security holes. The issue arises because it’s easier to be lazy and reuse old code in the form of libraries than to write it yourself. Yet, most such libraries contain screeds of unwanted junk, plus they date from the pre-Internet era when security was not considered greatly important.. The fact that the models use Fortran suggests that they may contain code dating even from the 70’s or 60’s. Not that there’s anything wrong with Fortran itself, it’s arguably a better language than C, but the ancientness of the code itself is likely an issue. Is that so? I’m no programer but back in the mid 70’s I did take a computer science class at IU. Those were the days of time share and key punched card input. And we used Fortran! And that is still used today after so many advances? Amazing! FORTRAN ha, my first programming was done in 1958 using interpreted FORTRAN running on an IBM 1401 at General Motors Institute. Just before I retired from GM, I had an “expert” from a consulting firm tell me my data (measured with calibrated equipment) was “wrong” because it didn’t agree with the output of his FEA model. If the modern users of established matrix procedures (FEA) knew how sensitive the results were to the boundary conditions of the many boundaries, I doubt they’d be willing to make such outrageous claims. – The old guys who wrote those ground breaking codes were rather amazing. Twenty years of progressive policies, government grants, and indoctrination of the youth, the facts will no longer matter. Just like UN Sustainable Development it will have become fact regardless. In some data sets we are already at 23 and 26 years respectively. This meme should already been long dead and buried. If the models did reasonably model the most material mechanisms affecting global temperature the you would expect their results to be scattered about the observational record and not biased so obviously to one side. The fact that the ‘models’ all start with the same value also distorts the general picture as it reduces the apparent divergence. What would happen if the models started at the same temperature as HadCrut in say 1900 or even 1850? PS “(reviewed by John Cook) ” LOL. Say no more. Has anyone looked at the 2/3 of abstracts in Crook’s 0.3% “consensus”. Around 788 abstracts that mention either global warming or climate change should fall in only a few categories – there aren’t that many options. Link to Crook’s brainwashing manual. Does he still have his SS selfie posted? I’ll drink to that. Truth is I just did. Reviewed by a cartoonist????????? You mean “unpredictable”in the sense that the science simply cannot be settled? I sympathise enturely that the science is not up to modelling “centennial scale simulations” but does that also not simply underscore the fact that the science is not ‘settled’. On what basis are people who critique overconfidence in the models as a predictive device get smeared with the disgusting term “denier”. They are denying what? An “unpredictable” phenomenon that cannot be modelled at the “centennial scale”? Can you imagine the CAGW case being brought as a criminal prosecution? In fact even as civil proceedings? Counsel for the defence/respondent would have a picnic at cross examination. It would make legal careers, a lot of money and for a lot of fun up on one’s hind legs. If these ocean current changes, which are variable and largely unpredictable, can “absorb heat and mask warming” , doesn’t it go without saying that they could release heat and mask cooling? Yeah but that’s not climate science it’s only common sense. Which probably means that it’s supported by observation and scientifically sound. appinsys.com has multi-decade graphs of AMO, PDO, etc; variable and unpredicable? To the UN, which realizes that climate cycles have a ‘catastrophic” effect on the fascist AGW-sham. At least they’re finally admitting that there is more to climate change than just CO₂. But if global temperatures start warming again, they’ll be back to giving CO₂ all the credit. Other factors only kick in when they need an excuse for why it isn’t warming as expected. I was under the impression that the IPCC reports said that the natural variability was swamped by the wonder gas CO2. We now have this man telling us it’s the other way round. Who collects the data? Climate scientists. Not those who post to websites like this claiming some (superior) knowledge on the subject. Instruments collect the data, not scientists. Climate scientists, those using land based surface data, then adjust it to their liking — infill, homogenization, TOA, algorithm, etc. You do have a point though, no one posting here has knowledge as to why the adjustments are valid or needed. It’s a black box. Er, no. Instruments measure the data, scientists collate and collect. Interpretation of data is where the subjectivity arises. Remember, if you repeat a complex study and get the same exactly the same results as a previous study, there is a serious flaw in the methodology. Radiative physics! Oh, the HUMANITY!! While I don’t claim “superior knowledge” I do claim that I got a college education before our colleges and universities became leftist indoctrination centers-and understood early on that AGW was a crock of pure,unadulterated horsepucky. Maybe now that it’s been determined that higher levels of CO2 increase the potency of marijuana-the Gaia worshipers will go back to getting stoned, and let the facts speak for themselves. Has Al Gore resumed inhaling since it’s now legal in a few states? I think manbearpig has been inhaling the whole time,and with the recent study that stated the increased CO2 levels are increasing the potency of pot-he’s more clueless than ever. Well 82 F is hotter than 76 F and 68 F is not. But then, that’s just me. Cecil I doubt if you know the qualifications of some who do post on this site. If you did I think you would be in for a shock. Hello Cecil, welcome to WUWT. Had you been a regular reader/participant in the long conversation, you would have known that quite a number of scientists- “climate” and otherwise- often join the fray, here. You would have also known that your post is a fine example of certain kind(s) of logical fallacy. Stick around and find out for yourself. Really?? It sure as hell doesn’t prove its right! Climate Fear Mongers Hate the Facts….Models are Easier to Manipulate! Well, 12 years ago Hansen proclaimed that this is complete nonsense since at least 2003. So the natural forces that drove the Viking Warm Period (Medieval Warm Period) and those that drove the LIA were “small forces”! What about the forces that drove the Holocene Optimum, the Minoan Warm Period and the Roman Warm Period (all of which were warmer than the Viking Warm Period)? What we do know about the drivers of the above is that they were not driven by manmade CO2 emissions, and if the proxy data is correct (and the claim of climate scientists that CO2 levels during the Holocene prior to the industrial revolution were stable), not by CO2 at all. So you stopped the HADCRUT at 2013 (La Niña year, how did I know) when it was in the 0.40 C. But the last three months are at 0.62C. Go look at your graph for 2015. Pretty close. A five year running mean has to have its final date 2.5 years before the present date. I suspect trafmadore needs a more detailed explanation as to why. He seems to think that you can average temperatures that haven’t been measured yet. Perhaps, in his mind we can, we just substitute in model data instead. What’s the difference between reality and the Matrix after all? A centered 5 year average? First, there can’t be a value for 2013; the latest would be Sept of 2012. HADCRUT global? The correct value for the last time point is 0.50 C to the graphic’s 0.38. And with a 5 year average there is never a warmer 5 year period than the last data point, although there are ties due to the 2007 and 2010 El Niño years, at both at 0.50. That graphic has highs in 0.03C above present in the 2003 time frame. So I don’t know what is being graphed really. There is an error in the original annual HadCRUT data; viz., 2015 is assigned a value, although the year is not yet over. Carelessly accepting that allows a five-year centered average to be calculated for 2013. Additionally, the HadCRUT data (at least; I haven’t checked the UAH data or the model outputs) appear misaligned; what are labeled 1983-2013 running means seems to be for 1981-2011. 0.22 degrees warmer. Oh my gawwdd!!!! Quick, put the a/c on as that couple of tenths of a degree has got me frying!!!! Anytime I see the term “factcheck” in a URL address I steer away from it. Saw the link to “theconversation” earlier today while (whilst?) looking for reports on the Atlantic AMO story. Dr. Gupta appears to be non-convergent of natural variability. Global temperature rise as presented by IPCC shows a 60-year cycle with -0.3 to +0.3 oC. In the case of Indian rainfall — all India Southwest Monsoon rainfall that constitutes 78% of the annual mean — presents 60-year cycle. The data was published by IITM in 1995. In the case of Brazil, the rainfall presents 52 year cycle — the paper was published in Brazilian Journal. The Durban Rainfall presents 66-year cycle [Canberra] in Australia, the sediment data show the same cycle], Mahalapye in Botswana presents 60 year cycle and Catuane in Mozambique presents 54 year cycle but all three presents a similar “WM” pattern. The same is the case with Fortaleza in Brazil. Indian onset of monsoon over Kerala coast present the same 52 year cycle. The Hurricanes present a year cycle similar to Indian southwest monsoon precipitation and Typhoons followed the opposite pattern. In the case of the two Southern states that receive rainfall in two monsoons and pre-monsoon and post-monsoon cyclones. The annual rainfall presents a 132 year cycle and the individual monsoon precipitation presents 56 year cycles in opposite pattern. The Bay of Bengal cyclones follow the northeast monsoon 56-year cycle. All these are published in my books starting from 1993 and they are available in internet. Please note; aeroplanes are designed using VERIFIED models, this verification process started with two brothers (Wilbur and Orville) who invented the wind tunnel before they got their aeroplane to fly. Then they build physical scale models of different aeroplane wing shapes and tested them in the wind tunnel. This process has been ongoing and improved on ever since. Create a model, verify the model (with small scale tests), improve the model, verify again, and so on and so on. NOBODY but NOBODY creates a math model of how an aeroplane will fly and then builds a full sized aeroplane and puts passengers inside and takes off based on the output of the model without verification steps along the way. It sure seems like the AGW aeroplane’s tires are still firmly in contact with the runway even though the “extremely helpful models” claim it is soaring in the heaven’s. You think the wheels have tyres? I was giving the climate modelers the “benefit of the doubt”. Since they seemed to “gloss over” the effect of clouds on the climate I expect that a climate modeler’s version of an aeroplane would just assert that “wings provide lift” and not bother to model the wings in any detail. Heck, wings are just a “forcing”, no need to bother about the details, there are grant applications to write first…..
Modelling the climate of the Earth is a fool’s errand, and like most fools the climate modelers don’t even know how much they don’t know. But they are quite certain that anybody that does not “believe” in their models is “as dumb as a box of rocks”. You think the fuselage even has wings? Ok, slight correction, Wilbur and Orville may not have “invented” the wind tunnel, it appears that others may have built one before they did. 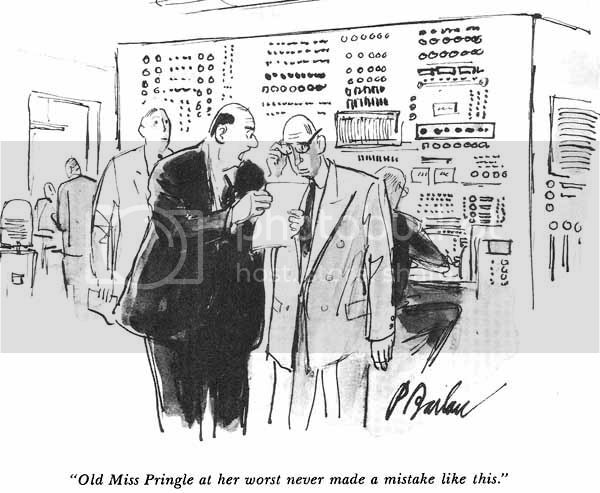 But they (Wilbur and Orville) certainly were several of the first scientists (aeronautical engineers) to apply the concept of “verifying” models against actual observed data. Verification, it’s a good thing. Model all you want, but if you don’t verify then you should be subject to significant scorn…. Speaking as a modeller of such things. I can confirm that there’s a lot more to building a plane than a few model runs. We wouldn’t trust a model in its own. All the models we use are limited and constrained. They are merely useful tools… there’s wind tunnels scale models prototypes etc etc. Even though we have sufficient understanding to mostly build planes that stay in the air on average. We do not… and I emphasise this for clarity do NOT have a full enough understanding of it all to build planes from models. 99.999% of models agree – the earth is wrong about global warming! Still trying to sell the idea that the deep ocean ate the global warming. I thought that it had slipped down between the cushions on the couch. Some of it has been photosynthesized and converted to chemical energy. Greening of arid zones. I love this new but well known to be presented BS excuse. No models are tracked on long range time scales because the error bars increase vastly and they keep climbing and climbing to new highs…. to the point where if you let a global warming model run long enough the Sol system becomes a binary star system. Further yes people who believe in global warming are creationists… but even creationists believe the earth is older then a few hundred years so they should be able to model it a bit better then they do. Gupta is clearly a denialist bed wetting fundamentalist Koch paid scum deliberate liar. The consensus agrees, so it must be settled science, that CO2 is THE driver of climate. Only a subhuman denialist who hates his grandchildren would dare to put forth the lie that anything other than Fossil Fuel Industry subsidized CO2 emissions are responsible for every rain drop, every puff of wind, every drought and flood, increased Antarctic ice cube and all the missing Arctic sea ice. Gupta must have his grants cancelled, his tenure terminated, his publications withdrawn, and be spat upon by his post-doc students before they can be allowed to leave his wicked non-conformist faux skeptic machinations. You’ve convinced me. Where do I send my money? I blame you for my recent coffee/keyboard interaction incident. – Michael E. Mann, co-author, Science ( 2015 ) published paper, as told to Quartz ( http://qz.com/about ) in an email. and, since these fluctuations are not included the modern climate models, the models are not reflecting what actually happens. Now it’s “confusion,” not “denial.” The predictions are wrong because so many of us are confused about the causes and linkages between CO2 and global warming? OK, so now I’m confused. I’m confused too Mark… as in why the ecoloon scientists keep using most of those models that are so far off. If a business owner had a 100 financial plan runs and 97% of them were so far from reality after 20 years like these climate models, they’d throw them out, not lump them together or call it a valid average. Any potential investor doing due diligence would laugh at that business owner for doing things that way, and walk away. You’d think that someone in the climate modeling world should see that 97% of those models are worthless, and they’d stop producing them and definitely stop showing them as valid, and start over with empirically-based assumptions, not the now thoroughly discredited ‘CO2 science’ as represented by the 97% failures. oops, I meant “…would laugh at that business owner for doing things the way climate modelers do projections, and walk away. Why do you suppose that the average tenure of Chief Executive Officers is 5 years? Because in five years either he does very well, and can then go on to higher and better things – with a superb exit package – or it is going pear shaped, he can see it, and is getting out before the excrement hits the rotary air disturber. There’s no dispute about the warming effect of CO2 on its own namely ~+1C for every doubling of concentration. It’s the assumed add-ons, the positive feedbacks attributed to mainly water vapour, that push the models to extremes way beyond the observations, feedbacks for which there has been no observational evidence in the 150 or so years of the rising CO2 concentration. Incidentally CO2 started to rise about 100 years before human emissions took off just after WW2. In fact the basic CAGW relationship: human emissions –> rising CO2 –> global warming is exactly the chronological reverse of the observations: most recent global warming (starting ~1750) — rising CO2 (starting ~1850) — human emissions (starting ~1950). Yes, the ice cores tell us rise in CO2 lags temperature rise by 800 years. And what happened 800 years ago? Can you say Medieval Warm Period? I knew you could. Only rarely do I see that pointed out, and I don ‘t know why that is. Willing to spend? More like already spent. You can’t make this stuff up. Supporting the veracity of climate models….or any model for that matter…that fail to meet predictions because “…they don’t (and wouldn’t be expected to) occur at the same time as they do in observations.”….is beyond reasoning. Basically he’s saying it’s the fault of reality for providing data not consistent with the models. Biologists told me for years that homosapians (us) evolved from Neanderthals. Biologists gave the % of DNA argument showed me a picture illustrating several images starting on the left with a chimpanzee then an orangutang etc until there was an image of a modern man on the right. It never seemed correct or obvious to me that Neanderthals were our predecessor. Boy, if you ask a question about that!! Look out! Now that the human genome project is well underway and large scale genetic sequencing has been done on people everywhere as well as some neanderthal teeth, we now know that homo sapiens interbred with neanderthals, they didn’t evolve from them. Caucasians (like me) have 2-3% neanderthal DNA (whatever that means). African (blacks) have very little. (whatever that means) Ahem that means there is a problem with common descent of modern humans at least in the last 100,000 years. Don’t say that too loud or you may be accused of eugenics or being racist or something. Make sure that the Lewandosky moron reads this comment. He’ll make a study out of it. So all along the idiot copycat biologist thugs who beat up my curiosity in human evolution by, WITHOUT EVIDENCE, making me repeat the now proven wrong, theory of evolution of modern man FROM neanderthals. I was also told “by scientists” like Bill Nye that the universe was always here too….that there was no moment of creation. What complete jerks they were. Every one of them. Not one biologist teacher or professor, expressed the smallest amount of curiosity in the possibility that evolution did not follow the WRONG linear progression of development. Every single one of them were incurious morons, without exception, in my 21 year education, especially Miss Newman. She was down right certain about her “science”. So a biologist speaks! What now does the biologist have to say about the climate no less. Biology IMO does not insist and teach the principle of establishing what you think know and being honest about what you do not know. They skip over that part of science. I had a budding PhD student, (a lab demonstrator) try to explain to me that cells are the size they are because they could not be any bigger based on the fact the the volume to radius ratio get bigger as cells get bigger. ????? It was such a baffling idea, I admit I may have misremembered it. I recall asking the lab demonstrator “compared to what?” I was thinking that maybe it was an oxygen diffusion thing and the base unit was really and oxygen atom. Nope…. it was the radius to volume ratio… no med school for me!!! I am a bad student! The most important thing that Eric Worrall mentioned was that a biologist wrote this. Ok. So we can take it with a grain of salt. It could have been worse… a psychologist could have written it. A 5 x 5 x 5cm cube has a volume of 125cm^3 and a surface area of 150cm^2. But if you divide the same volume into 125 cubes of 1 x 1 x 1 cm, the surface area increases to 750cm^2. Likewise, the ratio of cell membrane to cell volume increases with smaller cell size, allowing for a more rapid rate of chemical exchange (nutrients in, waste out). The exchange rate would probably be inadequate if cells were larger. Amoebas don’t seem to have such a problem, especially the so-called “giant amoeba” Chaos carolinense, which can reach lengths of 5 mm,. ergo my “compared to what” question. Compared to the O2 molecule size. Ok, we agree. So all along the idiot copycat biologist thugs who beat up my curiosity in human evolution by, WITHOUT EVIDENCE, making me repeat the now proven wrong, theory of evolution of modern man FROM neanderthals. Now I am learned in both the biological and physical sciences and am also an ole computer designing dinosaur ….. which is only a part of my resume “talents” …. and I take offense at your utterly ignorant characterization of Biological Science et el. Now I agree that many of the generally accepted biological claims (human evolution, brain/mind functioning, etc.) and the subject matter of current research projects/studies are in serious need of being questioned and/or criticized …… but not by someone like you who appears to be extremely biased against and totally ignorant of the discipline. You remind me of a Bible believing Creationist whose science education both “began & stopped” when he/she was told that …. “man evolved from a monkey”. But in your case it was ….. “ … FROM a Neanderthal”. What complete jerks they were. Every one of them. Not one biologist teacher or professor, expressed the smallest amount of curiosity in the possibility that evolution did not follow the WRONG linear progression of development. Every single one of them were incurious morons, without exception, in my 21 year education, . Blaming others for your own failure to achieve anything meaningful in life seems to be rampart within the mindset of the younger generation. I have achieve a great deal by ignoring the mentally entrenched and the incurious. Google my name! Also you missed the point. Your brain went to the default mode… you know… creationism. Where dis that come from? I am and was being critical of the Biolgists, their training, and unwillingness to test their own theories and try new things and abandon bad assumptions…You got waaaay off track there buddy. If you are incapable of figuring out the reason for my, … uh, ….. “creationism” statement …. then I have serious doubts about your per se …. Googled resume citations. This ain’t my first rodeo, ….. ya know. I’ve seen lots of engineers and inventors come and go, …. the good, the bad and the BS’ers. And I have known a few of the great one too, …. so don’t be blowing smoke at me. I’ll just get irritated again. And what I stated above still holds, …… your voiced comments that I criticized portrays the “real you”. Whatever you ole obsolete cranky coot. rodeo??? WTF? Creationism? WTF?? Got a whole Lotta crazy there old boy! Seeee Ya. NOT! The trolls have repeatedly insisted that my opinion is immaterial because I’m not a climate scientist. Might I ask the trolls, some of whom have made an appearance on this thread, why Gupta gets a pass? I know his article was reviewed by a cartoonist, does that make him a climate scientist? No biologists get a pass. IMO. Biology is a near discredited discipline. It is where all the dim wit pseudoscience students dwell. Usually $200,000 in tuition to study “marine biology”. Say “marine biology” in the interrogative while chewing gum and you’ll get what I mean. Are those the guys that capture and dissect rare sea creatures to see why they are dying out ? IMO. Biology is a near discredited discipline. It is where all the dim wit pseudoscience students dwell. HA, …. rejected by your true love who claimed a greater passion for an intelligent biologist, ….. HUH. Don’t hold your breath for all the great “science” to come from this bunch of budding biologists. Yeah… don’t forget the work ethic (lack thereof) and chronic alcoholism. Ya’ll quit complaining via the snarky remarks rhetoric, …. it was the Wacky Tobacca smokers/pushers of ya’lls generation(s) that literally ruined the Public School System in the US, …. thus it is now “sucking hind teat” in the World Ranking of Student Education in Science, Math and Reading. Thus me thinks a reassessment of what ya’ll think you know, …. were nurtured to believe, ….. would be my recommendation. One has to “learn how to learn”, ….. “learn how to think and reason”. The aforesaid are NOT inherited mental traits. Both Watson and Crick were biologists. Most medical progress in the last few decades has owed much to their work and that of numerous other molecular biologists who followed them. The same goes for progress in agriculture, criminal detection and many other disciplines. On a slightly different track, if climate scientists had a better understanding of biology they might not be quite so (afraid of)/(alarmist about) increasing levels of CO2. Even a broken clock is right twice a day. So you named 2 worthy biologists OK. I will accept a couple of exceptions. The DNA information structure was initiated by George Gamow, a physicist who Crick credits, and the x ray diffraction photo #51 of the double helix was taken by Raymond Gosling, a physicist. Analysis was none by Rosalind Franklin a chemist. Her work was scoffed, without permission by Watson. Maybe their worthiness is conditional. And if climate scientists … and a few mechanical engineers ….. had a better understanding of biology they wouldn’t be making their asinine, silly and/or dumb arsed claims of fact about physical science process that are highly influenced by biological process. Atmospheric CO2 biyearly cycling caused by Northern Hemisphere greening … is but one of their idiotic claims. That would be dumb-arsed, not dumb arsed. That would be for future reference. Still trying to impress me, ….. HUH? An earned Degree via a college education does not bestow intelligence upon the recipient of said Degree ….. so don’t be touting your IQ on account of said. Iffen you want to be impressed …. then take your own advice …. 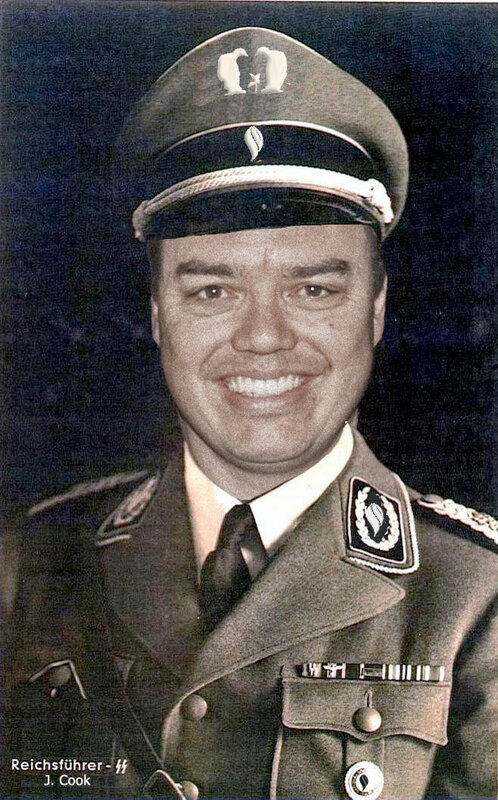 only this time you Google the name ….. George R Cogar ….. who was a High School drop-out. Also, from the University of NSW Climate Change Research Centre, the group involved in the Ship of Fools Antarctic Incident. How long do we have to wait for them to acknowledge what is right……? A…. L O N G time, methinks. As long as it takes for temperatures to drop by a degree, about three years from now. Ironicman… as long as they get to continue adjusting the data, there will NEVER officially be a drop in temperature. Seems the climate has already returned to the the 1970s yet it officially is the HOTTEST ever according to the “corrected” data. If Climate models are correct but are being skewed by these other factors, how is it that they’re ALL ALWAYS skewed in favor of increasing warming? If a grocer’s scale was found to be defective, and he claimed that it wasn’t his fault because the scale was affected by temperature and humidity, people might believe him if the scale had sometimes registered fresh produce as being too heavy and sometime as being too light. But if it always registered things as being heavier than they actually were, everyone would conclude that the guy was a crook. All along the skeptics have been saying that you can’t eliminate random variation as a leading cause of the warming that we saw in the second half of the 20th century. The alarmists retort was that they had eliminate random variation as a possibility — after all they had reconstructed the climate over the past 2000 years using chicken bones and tea leaves and had shown conclusively (with multiple lines of independent evidence) that the climate was in near perfect stasis with barely a wiggle in surface temperature until humans began to emit CO2. Now, in the face of a total collapse of the computer models, they argue that there is actual a considerable amount of random various in the climate. So now that they have accepted our argument that there is much more natural variability than what they previously believed, how can they continue to say that the majority of warming can be attributed to human emissions of CO2? They must now accept the fact that equilibrium climate sensitivity to CO2 is substantially less than the IPCC says it is. You can’t have it both ways. It’s called having your cake and eating it, too. A principle beloved by Progressives. What change in aerosol emissions? The pause is getting quite long now without anything unexpected that might reasonably be slowing down the warming. You can’t use the “natural variation” argument when there have been no major changes from when it was “dangerously” warming. The Sun hasn’t been as quiet for 100 years, as it has been since the modern maximum in solar activity ended in 2003, after several very active solar cycles #21, 22, and 23. I think the main problem with these models is that they were tuned to not consider that some of the rapid warming from the early-mid 1970s to a few years after 2000 was due to an upswing of a multidecadal natural cycle. I tried my hand at some simple Fourier on HadCRUT3, which is the surface temperature dataset that has the better agreement with both the UAH and RSS TLT datasets than all other surface temperature datasets – including all versions so far of HadCRUT4, and all versions of GISS that existed since a couple years before HadCRUT4 was released. What I tried on HadCRUT3 annual figures (the UEA version thereof, as opposed to the more-warming-lately UKMet version) was finding period and amplitude for a 2-cycle period, analyzed from one peak to 2 peaks later, with period around 60-70 years, to maximize the reported amplitude of the cosine component. My results: Peak-to-peak amplitude of .218 degree C, and a 64 year period having peaks at 1877, 1941, and 2005. So, I think about .2-.22 degree C of the rapid surface warming that occurred from the early-mid 1970s to shortly after 2000 was from a multidecadal natural cycle, and the downturn side of that natural cycle is a major reason why we now have a pause – which I expect to continue until approach of the next upward-turning corner, which my method suggests will be around 2035. I think that if “the models” are re-tuned to consider that their hindcasted rapid warming from the early-mid 1970s to shortly after 2000 had .2-.22 degree C of the warming being from a multidecadal natural cycle, then they would be much less alarmist in their predictions, and predict warming of this century to be around 1.1-1.5 degrees C as their median warming prediction, and around 1.25-1.75 degrees C as their mean warming prediction. In such a case, I would expect around 60% of such modified models to be outrunning HadCRUT4 now, and a 50-50 split of the models around HadCRUT4 to occur later this decade as the pause (which I think started around 2001-2005) continues through what I expect to be its midpoint. If HadCRUT3 was still being determined, and would continue to be determined for the next 20 years, then I expect that the 50-50 point of HadCRUT3 catching up with multidecadal-cycle-considering models would be around 2020-2023. 2023 is the midpoint of the cycle that I analyzed (?) in HadCRUT3. I expect 2020-2023 is likely to be where the midpoint of The Pause will be, if its start date is considered as a time this century, and the 1998 century-class spike with its both of its adjacent La NInas is considered as a late feature of the pre-pause rapid warming, as opposed to (with neglect of part of the preceding La Nina) being an early feature of The Pause. Gupta is correct. There are many variables that affect climate and CO2 is just one; and a very minor one at that. Since the end of the Little Ice Age in 1850, the CAGW hypothesis has only “worked” 20 years (1978~1998) out of a total of 165 years. During all other times, manmade CO2 emissions were either to small or global temps and CO2 levels were inversely correlated. Over the past 20 years, 30% of all manmade CO2 emissions since 1750 have been emitted with almost no global warming trend to show for it. 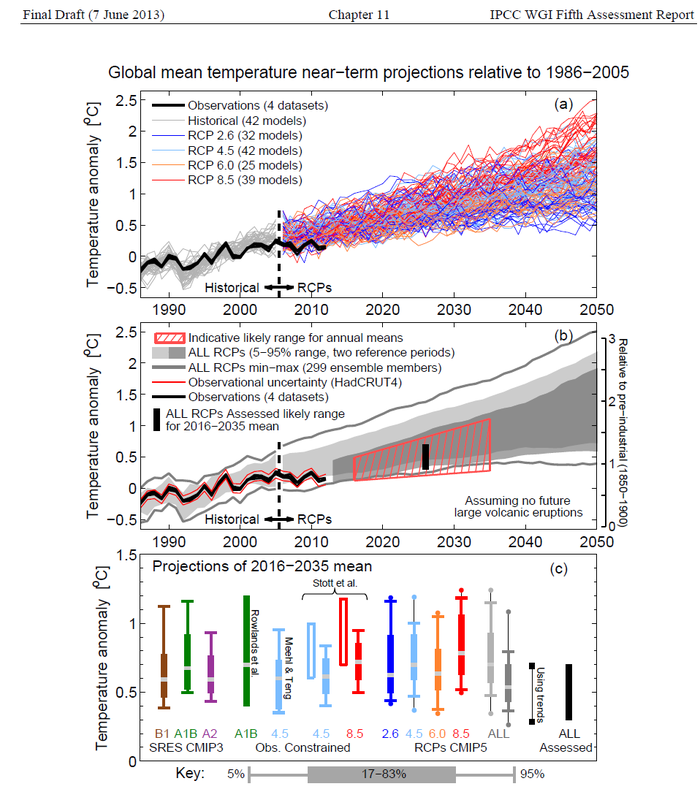 According to CAGW projections, the global temp trend should have been 0.2C/decade since 2000…. Not so much. 1) a 30-yr PDO warm cycle started in 1980. 3) it marked the end of the strongest 63-yr string (1933~1996) of solar cycles in 11,400 years. 4) a 30-yr AMO warm cycle started in 1994. 6) the Super El Niño of 1997/98 occurred. 7) oh, yeah, the highest levels of manmade CO2 emissions in 4.5 billion years. 1) No global warming trend for almost 20 years. 3) the current solar cycle is the weakest since 1906. 5) only 3 El Nino events since 1998. 8) oh yeah, the most manmade CO2 emissions in 4.5 billion years occurred from 1996 to 2015 and no global warming trend to show it. Warmunists can’t have their cake and heat it, too…. If warmunists blame natural cooling factors for “the 20-yr Hiatus”, they then have to admit that most of the 1978~1998 warming was also caused by the aforementioned warming factors and not CO2. CO2 is a bit player. The empirical evidence and physics show doubling CO2 will only cause between 0.5C~1C of gross warming per doubling by 2100, plus or MINUS whatever the sun and other factors decide to do over the next 85 years…. The science of Global Warming is absolutely sure and completely certain. Addition of CO2 to the atmosphere causes the atmosphere to warm. Why then no or negligible change in atmospheric temperatures since 1998? Answer, there are natural forces counterbalancing the warming. If these forces are equal to the warming, then it must be that when these forces are applied in the opposite direction, (as is assumed from 1979 to 1999) there will be a rapid rate of warming. So one can speculate with a high degree of certainly that the warming 1979 to 1999 was 50% due to CO2 and 50% due to random natural forces. It follows that any reputable climate scientist (if that is not a non sequitur) should re-run his models with the forcing attributed to CO2 divided by 2, and see what the result is. If he has correctly assessed the values for the natural, random elements, his resultant graphs should be evenly spread either side of the actual temperature data. If there is still an imbalance – ie, the ‘projections’ still average higher than actual average temperatures, then the value of these natural random forcings should be increased. Make the models fit the actual, not hope to make the actual fit the models! That should be “oxymoron” not “non sequitur”. Dudley– There were two periods of warming during the 20th century: 1913~1940 and 1978~1998. The first warming period could not have been caused by CO2 as manmade CO2 emissions were much too insignificant to cause any warming, so one must look at shared warming factors which include: both had 30-yr PDO warm cycles in effect, both had 30-yr AMO warm cycles in effect, and both had strong solar cycles in effect. It’s apparent that 30-yr warm PDO & AMO cycles and strong solar cycles are what drove the two 20th century warm cycles; not CO2. Since a 30-yr PDO cool cycle started in 2008, a 30-yr AMO cycle starts in 2022, the current solar cycle is the lowest since 1906, the next solar cycle is expected to be the lowest since 1715 and there is a chance for a 70-yr Grand Solar Minimum starting from 2022, it’s likely global temps will be falling for at least another 20 years and perhaps for as long as 70 years. Even without a GSM, global temps will likely be flat/falling for the next 20 years. Dr. Curry was right, in another year or two, it’ll be 20 years without a global warming trend, which should be sufficient to falsify the CAGW hypothesis. One could speculate, but that is all it would be; speculation. One would be fooling oneself if one thought they had “found” the increased CO2 warming signal. That should be “carboxymoron” not “non sequitur”. Let’s get the chemistry right. “Gupta is correct. There are many variables that affect climate and CO2 is just one; and a very minor one at that. Yes, but it is worse than that. If one looks at the satellite data, there was no warming between 1979 and the run up to the Super El Nino of 1998. The Satellite data and the land based thermometer record are very much at odds during this period. Of course, Michael Mann’s trees post 1960s were not showing warming so I gues both trees and the satellite data suggests that there was no warming between 1979 and the run up to the Super El Nino of 1998. The satelliet data shows that over the past 35 years there has been a one off single and isolated warming event which event (the 1998 Super el Nino) is not the result of manmade CO2 emissions. There is no first order correlation between CO2 being a temperature driver on any time scale, and this is why the matter has to be fudged with aerosols etc upon which there is no hard data and heat hiding at the depths of the ocean upon which again there is no data. There’s no sign in surface data that CO2 has reduced nighttime cooling, in fact 30 of the last 34 years it’s greater than the prior day’s warming. The fundamental problem with the climate models is they try to do too much. The modelers have been sent on a “fools errand”. Since CO2 is the main issue and since it is a well-mixed gas and changing very slowly, it makes more sense to first estimate the average global warming, than the feedbacks, and then how the average will vary with location. Observational data can’t help except eventually perhaps to falsify. To do this basic physics and a simple energy balance is the best way for the first step, but only after balance requirement is extended to the surface and the atmosphere as separate entities. See my “Improved simple climate sensitivity model” that helps do this and more. Then whatever CO2 does will be added to everything else of which we don’t know everything and can’t do much about anyway. I seem to remember prior to climategate that natural effects were thought to be small or negligible next to carbon dioxide. It must be marvellous to be a climate “scientist” just make it up when your predictions do not turn out and continually change the goalposts! A 20 year ‘pause’ or ‘hiatus’ in temperature increase is not required to falsify global climate models. Five years is more than sufficient to render the GCMs useless, or worse than useless as applied by the alarmists. The whole GCM model design, scripting and run process is indicative of GCM value. Immediately after a bad model run is completed, where are the dissection reports? Surely they’ve reviewed every component of code and identified where that particular run skewed off? If those wonder modelers of the climate world are baffled or puzzled by specific or even nebulous code issues, where are the attempts to pull in true experts to assist with the code? Instead the climate wonder children have doubled down so many times they’ve run off the scale. Observations can’t be adjusted that far without getting obviously busted!? Blame the skeptics for not believing. Claim that averaging bad runs brings out what’s good!? Ignore the mathematical fantasy required by loudly proclaiming the averaged trash accurate. Buy a super computer and claim it will do miracles with bad code. Run the bad code and then claim that Igor needs more power. Now; have a goofball write up some nonsense that endless GCM runs failing to match reality is a backward kind of validation then have the infamous cartoonist review the claim? GCM Bogosity from top to bottom by all involved in the GCM world. The default null hypothesis for any change in climate is internal nonlinear oscillation or state change, with no external forcing needed. Until this is understood and acknowledged at the outset of any discussion of climate change, then climate science remains on the road to nowhere. Sorry, but when 98% of models are shown to be wrong and no model has been shown to be right (to within acceptable error bounds) there is only AT MOST a 2% possibility that climate scientists MAY BE right. The difference is important when “climate scientists are mostly hiding in the fringes of their estimates”. This is the second paper attempting to make the claims you report. The first of those papers was cited by someone posting as Luke in another thread. I replied to Luke and I think the argument I then made also applies in this thread, so I copy it to here. The article provides a graph that compares a plot of climate model predictions with two plots of empirical data obtained from the real world (i.e. from radiosondes on balloons and from microwave sounding units on satellites). In each case, the plots are averages of more than one data set. Your link provides a graph that compares a plot of climate model predictions with model simulations of what empirical data obtained from the real world would have been if it not affected by real effects in the real world. Simply, some people have used computer modelling to invent excuses for why the climate models fail to emulate reality as indicated by the measurements. A falsehood gains traction when iterated. I suspect there will be more papers pushing the excuse before the Paris COP in December. I wonder if Praveen Gupta is related? He wrote all sorts of utter rubbish about the Six Sigma Scam. The climate models can only be declared scientifically wrong if the models were, in fact, declared to be predictive and fit for purpose. As this is routinely disavowed, we need only note that they are truly fit for purpose in political suasion. This is, also in fact, the stated goal of the IPCC. Alex Sen Gupta, a biological scientist, has written an article reviewed by John Cook (The John Cook from SkS)? So, a biologist wrote summat and reviewed by a cartoonist saying that (Climate) data is wrong but (Climate) models are right? Good Lord! Paris will be a real pantomime! Lets hope all the speakers are using swazzles. What we have learnt about psychology in the last 20 years: A great deal more. What we have learnt about the aims and ambitions of political elites in the last 20 years: Far too much for comfort…. Many of the comments infer that these guys are scientists when the correct word is activist. They are politically inclined to advance their agenda. They aren’t really into science, they are trying to manipulate the data to justify their social goals. It is not working..The emperor has no clothes. They want us to drink the poison laced Flavor Aid. Unfortunately my eldest daughter has sipped a bit too much and commented with the Koch brothers funding Ad Hom, She claims to be atheist yet apparently belongs to the First Church of Climate change. She hasn’t done the science, but has taken the alleged consensus point of view. She seems unaware that it is politics masquerading as science for the purposes of persuasion. Very sad. Anyway, if the scientists admit the truth, they would be obligated to give up their social planning policies too. They haven’t figured out yet that they have a cognitive dissonance problem. By the way, I am a CO2 fan, as more of it make my cacti grow nice and healthy. PS. Next time my daughter ad homs me again posting a link on my Facebook page to this site, I’ll ask her for the year by year funding Anthony has received and see how she reacts. Give your daughter a link to this comment here. Sourcewatch gives DeSmogBlog as its source. DeSmogblog makes the same claim, at http://www.desmogblog.com/heartland-insider-exposes-institute-s-budget-and-strategy, and gives as its source (in footnote 21): Richard Littlemore, “Heartland Insider Exposes Institute’s Budget and Strategy” Heartland Institute, Feb. 14, 2012. “In 2012 Heartland received 50 percent of its income from foundations, 28 percent from individuals, and 18 percent from corporations. No corporate donor contributes more than 5 percent of its annual budget. “For many years, we provided a complete list of Heartland’s corporate and foundation donors on this Web site and challenged other think tanks and advocacy groups to do the same. To our knowledge, not a single group followed our lead. “Regrettably, listing our donors in this way allowed people who disagree with our views to accuse us of being “paid” by specific donors to take positions in public policy debates, something we never do. After much deliberation and with some regret, we now keep confidential the identities of all our donors. This is standard practice by nonprofit advocacy organizations regardless of their philosophies. “Review Heartland’s 990 form from 2012 here at http://heartland.org/media-library/pdfs/2012-Form-IRS-990.pdf “. It’s not “largely koch brothers funded.” (You may be thinking of the Cato Institute.) Koch gave Heartland only $20,000 in the year of Gleick’s phishing expedition, and it was for health research—see the 1st McArdle Atlantic article that I linked to for the reproduction of the Heartland documents. I’m sure they’ve been guilty of a few “stretchers,” but that’s not systematic and relentless “lying,” as your wording implies. It’s easy to fall into the trap of thinking one’s opponent is deliberately lying if one is an inflamed true believer who is certain that nearly all the “findings” and assertions made by important sources on his side are true or mostly and made in good faith—and that disagreement with, and mockery of, them must be perverse, at best. “. . . and receive funds from the koch brothers to do so. PS: The belief in Koch or Heartland funding, derived from Gleick’s phony Strategy document is widespread, very damaging, and continually renewed by SourceWatch’s and DeSmogBlog’s libels. Getting a retraction out of them would be priority #1 if our side were a well-organized, well-funded machine. Alas, it isn’t. Regardless, getting a retraction (and suing if one isn’t forthcoming) would provide the most bang for the few bucks we do have. Well, the above statement is almost certainly true and there would no longer be any need for armies of ‘climate scientists’. Stating the truth would create an unemployment problem for a group of worthless parasites and save the western world from economic suicide, so obviously the truth must be suppressed at all costs. We have recently made some very scientific predictions. You may note that they immediately diverge from observed trends. BUT – we can assure everybody that they will be shown to be valid on a centennial scale. We only really need lots of money and attention on a sub-centennial scale. Please send us the money and attention now. Confirmation will almost certainly be assured in one or two hundred years time. Thanks, Cook, Mann, Lew et al. P.S. thanks for all the money and attention. The article (it is not a scientific paper ) is a critique of Maurice Newman’s scepticism concerning models . Mr Newman’s implication that discrepancies resulting from the recent climate fluctuation somehow invalidates climate models is incorrect. Climate models have been thoroughly and critically tested against observations and are able to simulate with fair accuracy the component of climate change caused by human emissions of greenhouse gases and aerosols as well as natural factors like solar variations and volcanic eruptions. However, long-term climate simulations do not and likely never will reproduce the timing of shorter-term random fluctuations, like the recent slowdown in surface temperatures. In the long run, this fluctuation, like many before, will just be noise on a gradually increasing temperature signal. Perhaps this has been done already? ‘Climate models have been thoroughly and critically tested against observations and are able to simulate with fair accuracy ‘ just how big is the barn to which these doors of ‘fair accuracy’ are attached too? ‘However, long-term climate simulations do not and likely never will reproduce the timing of shorter-term random fluctuations,’ of course by not defying what ‘long term’ actual means the author gives themselves full wiggle room to claim any period can be called ‘short term’ and therefore not significant. An approach which came about , like the missing heat , due to the failure of the models in the first place. ‘like the recent slowdown in surface temperatures’ actual has this supposed to be ‘science’ then to the standards acceptable to science , there is no slow down its ‘stopped’ or ‘paused’ . The notions of changing or unchanging, direction and magnitude are all well defined in science, so there should be no issue with the idea of ‘no change’ has a status. But then this not ‘science’ so BS wording is to be expected . Well you could show the author some e-mails that show much effort had gone into keeping this information from the public and that there was efforts to get journal editors sacked for punishing papers that went against the ‘consensus’ But I do not think this author is into ‘evdainced ‘ in any real sense , there merely out to show their loyalty to ‘the cause ‘ with a side order of grant hunting . I agree with this claim and also with the claim that the data does not prove that climate models are right. I accept the null hypothesis and declare that we don’t know what causes climate change, at least not in a quantitatively verifiable sense that supports a scientific theory of climate. The problem in climatology is the huge gap between what the scientists know to be certain and uncertain and what the promoters declare to be certain. The scientists have said that we accept humans as being the cause because we cannot discover a natural cause. This is the argumentum ad ignorantiam, the appeal to ignorance. In actuality ignorance is the motive for accepting the null hypothesis that humans are not responsible for global warming. The uncertainty in the data is the main justification for a scientist to remain skeptical towards catastrophic anthropogenic global warming (CAGW). What are the two models that standout at the bottom of the graph? What differentiates them from the others? Nobody knows, but the explanation is probably pure chance. Similarly, it is probably pure chance that one model prediction (shown in red) was that the temperature dip of 1993-1997 would not occur. Probably pure chance but it wouldn’t harm to check the input data to see what made them closer to reality? Different sensitivity, some negative feedback mechanism etc.? We all agree that the average of all the (wrong) models is meaningless. Does any have a couple of spare grad students dig into model entrails and describe the similarities and differences? (b) reject each and every model. I again remind of the following. The selection of models that seem to fit after the event is an example of the Texas Sharpshooter Fallacy . Such post hoc selection indicates nothing about ability to forecast the future but it is tempting to think it does, and fr-a-udsters use the temptation to mislead their victims. I again explain how they do this. A set of, say 4, different investment plans is generated. Each investment plan is sent to, say 4000, random people. At a later date one (or more) of the plans has provided a very good return. Those who were sent the ‘successful’ plan are now sent a report of its ‘success’ together with another investment plan. These new investment plans are another 4 different investment plans so 4 groups each of 1000 people each obtains one of these second plans. Again, at a later date one (or more) of the second plans has provided a very good return. Those who were sent the ‘successful’ second plan are now sent a report of its ‘success’ together with a third investment plan. These new investment plans are another 4 different investment plans so 4 groups each of 250 people each obtain one of them. Yet again, at a later date one (or more) of the third plans has provided a very good return. Those who were sent the ‘successful’ third plan are now sent a report of its ‘success’ together with an offer to invest $10,000 in the next investment plan which uses the astonishingly accurate prediction method that has apparently been successful three times without fail. If 100 of the 250 targeted people invest then the fr-a-udsters gain an income of $1,000,000. This is, in fact, the same ploy as is used when the ‘best’ climate models are selected after the event. I have had a post vanish. I would be grateful for your telling me if it does not appear in the ‘bin’ so I can do a repost. Thanking you in anticipation. How much did “they” pay Gupta to look like an idiot? Not so many will go cheerfully to the stake for money. There are motivations far more powerful. My 97.7% satellite data trumps your 97% ‘climate scientist’ consensus. For climate science it is not the evidence that will matter, it will be the cultural significance of the myths it postulates. There is historical empirical evidence that King Akhenatan existed and brought the concept of monotheism to the kingdom of Egypt but was forgotten after his death. Moses who also introduced the idea of monotheism while in Egypt has no historical evidence to verify his existence. Culturally King Akhenatan is non-existent, Moses is of course famous and renowned. One is a figure of history but not memory, the other of memory but not history. Models 100% wrong, 95% wrong is not remembered so unimportant, the myths left behind are important and drive cultural direction. One myth is that science hand in hand with government is never wrong. Another is that humanity is separate from nature and inherently a blight upon the land, redemption only available through paying tribute to the government and corrective government discipline. And there is the golden nugget that science has the omniscient capability to predict global climate and ecology centuries into the future. It is unfortunate that science is being used to create a cultural mythology but there it is. I am involved in this subject matter not because of fears about climate, but fears over the undermining subjugation of science. Once the rational underpinnings of society start to become undermined where do we go from there? the point is when were they rpoven to be right? and how?? We’re right because we’re wrong because we’re right. predictions?” published in “State of the Climate 2008” (dated August 2009) by the American Meteorological Society. By 2008, the temperature plateau had already lasted for a decade, though that was something admitted only in scientific papers, not in press releases or interviews meant for general consumption. So, they thought they were safe by concluding that at least some simulations could account for a 10-year plateau. I conclude that it never entered their wildest nightmares that zero trends would continue into 2015. They are blatantly stalling for time. “We’re not wrong, yet” is what they’re saying. They were never right. It’s easy to see from the 90 models graph that real temperature anomolies are running about 50% lower than the model averages (0.3 deg C). If this deviation was due to natural variation then at some point in the future we should expect real anomolies to be 0.3 deg C above the model average. Now is after about 30 years elapse from the start of the graph. So in 30 years time when a 60 year cycle (where have i heard that from) has been completed it would not be unreasonable for the real temperature to be at least 0.3 deg C above the model average which by then will be about 1.2 deg C ie 1.5 deg C.
So do I believe that global average anaomly will rise by 1.2 deg C in the next 30 years? NO. DATA NOT ONLY PROVES THE MODELS WRONG BUR THE WHOLE CONCEPT OF AGW THEORY. Here is the evidence. Why don’t you refute each point with data ,not theory to prove I am wrong. You will not do it because there is no supportive data. I would hardly call all these blunders SELECT EVIDENCE. AGW theory has predicted thus far every single basic atmospheric process wrong. Current data not agreeing with what AGW calls for. The biggest mistake of the modeler establishment was to ignore the longer term cycles and to project forward several decades of data linearly when we are obviously approaching, at or just past a peak in a millennial cycle. This is more than scientific inadequacy – it is a lack of basic common sense. It is like taking the temperature trend from say Jan – June and projecting it forward linearly for ten years or so. The modelers approach is analogous to looking at a pointillist painting from 6 inches – they simply can’t see the wood for the trees or the pattern for the dots. ( In a recent paper Mann has finally after much manipulation managed to discover the 60 +/- year cycle which any schoolboy can see by looking at Fig 15 at the linked post above). Climate models epitomize the Ludic Fallacy employing Recency Bias. 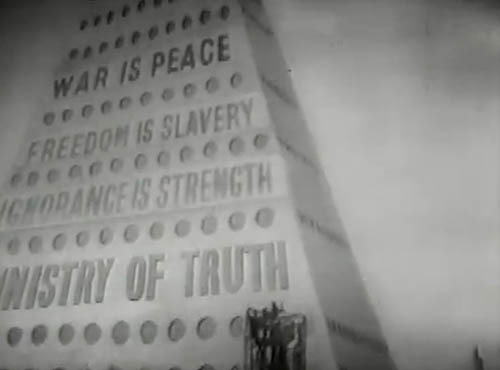 We are only one step away from the ultimate Orwellian situation where we are told, by “authority”, that observed data is not true and that the only truth exists in computer model output. So now Cook is an authority on ensemble climate models? They teach cartooning different at his school. Is it just me? All of these comparison graphs seem to be playing ‘Pin The Tail On The Donkey’ by normalizing the starting point of all plots at a single point. I’d really like to see what temperature the models show at the starting date of the graph. I suspect that would show somewhat wider spread from observed values. This defiance to correlating climate models to measured data is an example of money driving the car, being able to sell your services. If the people developing these climate models depended on sales income from people buying their models, and the people buying them needed accurate predictions, the model developers would correlate the models to match past results. But since the model developers livelihood depends on the continued spending by governments and others to study the changing climate, they need to demonstrate an urgency for climate science spending. The models must make a case for that continued spending. And models that match the past in showing a negligible change in the climate are not going to raise any urgency on the need to study global warming. I think what is really needed is a book or webpage or something that addresses the economics of global warming. The science stuff has really very little to do with “the debate”. So much of what is happening in this climate debate is just climate scientists trying to make money. The attempted shut down of skeptics isn’t because they think skeptics are wrong, its because skeptics are exposing their scam, or at least ruining their sales pitch. Climate models aren’t correlated to be correct, they are correlated to maximize funding for climate science (comment above). When there is a need for your services or your opinion you are raised in importance in our society, your time is worth more money, you make more money, so there is an economic driver for people who make a living studying and talking about climate to create and nurture an increased sense of urgency in studying the climate. The IPCC demonstrates this all the time. Only the Magratheans have developed a computer model that can accurately predict earth’s climate. Unfortunately they only made one such computer and the Magrathean Exclusion Principle means no other computer can accurately reproduce its predictions. The difference between the original and any other attempt to model it is the result of natural variability which can be measured but not predicted, The natural variability in question is the result of Desired Objective Fulfillment Syndrome. This occurs when the desired result of 97% of scientists (sic) conflicts with the natural order of the Sceptic Realists. Om!!!! Well this is right in line with the first rule of climate ‘science’ which is ‘when models and reality differ in value it is reality which is in error ‘ so I cannot see anything wrong here. Expect if your actual doing science , value honesty and consider your integrity to be important . All computational climate models included in the 5th phase Coupled Model Intercomparison Project (CMIP5) are already falsified, there is no need to falsify them further. None of them reproduces the observed inter-hemispheric symmetry in reflected shortwave radiation, nor do they exhibit the remarkable inter-annual stability in this quantity. On top of that their annual cycle of albedo changes do not even resemble reality. Until representation of the amount of energy absorbed by the climate system gets realistic, computational climate models are good for nothing. * From the mid-1940’s to the mid-1970’s we were suffering from global cooling (remember all the panic about “The Coming Ice Age”?). * But around the mid-1970’s we hit a “pause in global cooling”. What Judith Curry says is probably true re the surface data sets, against which model performance is assessed. If there had been a period of 20 years with no warming, then the CMIP5 model range would already be falsified. Could you run that again with the pre-adjusted data? Claim: Data does not prove that climate models are wrong. Simply amazing!!!! 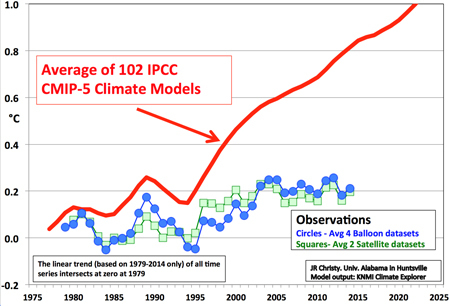 Consider the 2007 IPCC AR4. That report was hailed as the ‘gold standard in climate science’ – the settled science. That contents of the report related to those charts of rising CO2 scenarios and resulting rising temperature trends, determined by those costly crystal balls known as climate models. In short, AR4 implied rising Co2 WILL cause rising temperatures … and the rising temperatures WILL be responsible for catastrophic climatic events etc etc etc. But for the last 18 years, nobody disputes rising CO2 yet there has been no discernible rising temperature trend. Shucks!!!!! This one simple observation has rendered obsolete, the 2007 IPCC AR4. It shows the report was not “gold standard’, it was not ‘settled science’, and it was certainly not worth the paper it was written on! Channel 7 news. Coldest Autumn in Melbourne ,Australia since 1998. just putting on the record. I often wonder why, when comparing observations against model performance, people don’t use the IPCC AR5 metric. This, after all, is the measure by which the IPCC will judge CMIP5 model performance. As you can see, by the IPCC’s own metric, current observations are on the low side, but within the 5-95% range of projections. 2015 to date is currently aimed towards the upper end of the vertical green line (UK Met Office 2015 forecast range). KevinK: The Wright Brothers did not “invent” the wind tunnel. They made their own, using a bicycle to turn the fan to make the air flow. They recalculated the tables from Lilienthal’s “Der Vogleflung” and found an important systematic error in Lilienthal’s results. There is a STRONG CONNECTION HERE to the “psychology of science orthodoxy” , i.e. Lilienthal was THE academic authority with regard to the physics of flight during the second 1/2 of the 20th century. Taking his work as “definitive” and not challenging any of it, ended with many an academic declaring on the basis of “power to weight” calculations, that a “heavier than air” flying machine was IMPOSSIBLE. Fortunately the Wright Brothers were NOT academics, (8th grade educations both, typical of the era) and fortunately they did not operate on the “voice of authority”. the time for general “recognition” (NOT acceptance, being 1911, after the first Solvey conference (http://en.wikipedia.org/wiki/Solvay_Conference). The lesson here? As we get colder and colder in the next 15 years, about 2030, Svensmark well begin to be “looked at and by 2040, he’ll be considered the climate Einstein. our climate also changes as a result of natural and largely random fluctuations. Shame on Nature, beasty complex. Not adopting to our minimiced SuperComputing abilities.